Do you have friends who bother you with the latest conspiracy theories from YouTube or fringe "insider" websites? Do they leave you worried? If you’re online looking for Bible prophecy understanding, it’s impossible to escape scary conspiracy theories, even some that sound similar to what you read in Bible prophecy. But has end time Bible prophecy begun as the conspiracies seem to prove? Are predictions based on conspiracy theories reliable? Learn why conspiracy theories are not the way God is going to wake up the world, and what Bible prophecy says is his way so you can stop worrying about conspiracy theories. When I decided to start a website on Bible prophecy in 1999, I never expected such a large proportion of the questions posed to me would be driven by conspiracy theories. These days it almost seems like the Internet has been overrun by them. To be sure, I don't hear much about Holocaust Denial or the Moon Landing Hoax or whether canola oil is as toxic and unfit for human consumption as they say. The emails and Facebook messages I receive are mostly related to the conspiracy theories that seem to have a tie-in to Bible prophecy. These are hard Bible prophecy fans to ignore or dismiss without some help, which is why they contact me often in a state of great worry and contemplating potentially life-ruining paths. Conspiracy: "That recent major storm or earthquake was man-made (by HAARP, etc.). "Bible Prophecy: "There shall be earthquakes in diverse places" (Mt 24). Conspiracy: The Federal Reserve/Marxists/Obama are destroying America.Bible prophecy: Mystery Babylon the Great (America) falls in a single day (Rev 18). Conspiracy: "The New World Order (NWO) is going to take over the world (Zeitgeist). "Bible Prophecy: "And [the Beast] was permitted to wage war against the saints and to conquer them. He was also given authority over every tribe, people, language, and nation." (Rev 13:7). Conspiracy: "Planet X/Nibiru is on its way soon as this YouTube video proves..."Bible Prophecy: "The name of the star is Wormwood, and a third of the waters became wormwood. So, many of the people died from the waters, because they had been made bitter." (Rev 8:11). The most frequent conspiracy-inspired question I receive is about leaving the United States. Since many believe like I do that America's end is prophesied in Revelation 18, the conspiracy theories they hear about FEMA camps, martial law, closed borders, dollar devaluation, complete economic collapse, seem plausible. Perhaps America the Babylon's fall comes in waves before it ends in a "single day and hour" (Rev 18:8,10) they ask me. In this article I'll share what I have learned from Bible prophecy and experience over the years with conspiracy theories to enable me to see through them and stop worrying about what they say or predict. What Do You Mean, "Conspiracy Theory!?" First let me make it crystal clear that I'm not denying that there are indeed conspiracies in the world. I'm not a "disinformation agent." People obviously do conspire together to do evil--and so do angels. See, the Bible reveals the grandest conspiracy of them all, namely that Satan is running the world's kingdoms (Lk 4:6; 2Co 4:4) depicted in the Bible as carnivorous beasts (Dan 7=Rev 13). Satan will bring about the rise of the Beast (Antichrist) who takes control of the world for 3½ years before Jesus returns to take control and set up the Kingdom of God in the Millennium. If the term still bothers you, it helps to remember that calling something a theory does not mean it's false. It simply means it is unproved and disputed. For example, what once was a conspiracy theory that the IRS was targeting conservatives has now become proven and accepted as fact. This happened thanks to many reputable sources coming forward with evidence or admissions of doing this. Conspiracies theories, on the other hand, do not have lots of reputable sources. They come from individuals, often anonymous, and fringe websites. The problem is they lack credentials, verifiable proof or credibility. They get around this liability by connecting conspiracy theories to something else that is real. For example, since the US government has been found guilty of doing false flag operations in the past, then why can't we all see and accept that the Boston Marathon Bombing was one, too? The theories often start with something that is true and use it as a springboard into what is, on its own, ludicrous. Then when challenged, the theorist can refer to the true fact, asking if you can accept "X" happened then why can't you accept "Y"? Now in case you're thinking, "Tim, you're on the Internet expressing fringe views (on Bible prophecy), too" then you'd be right. But unlike a conspiracy theorist, I am not asking anyone to believe me or to do anything such as, "wake up and warn the ignorant, blind sheeple!" (as they do). In fact, I tell people not to share my research with people who are not asking for it to avoid creating offense or hurting your personal relationships. (There's no need to go to such lengths). Further, people can verify my answers with their own Bible, they don't have to trust my opinion or authority. In this way I aim to comfort people; not to bother anyone who does not have "ears to hear" (Mt 13:43). As one reader posted on Facebook, "I have researched conspiracy theories and the existence of the Illuminati since 2009. I have warned people and got quite a lot of aggressive reactions from some of those I warned. I have also got completely wrong some of the things I said and made a complete fool of myself. Fortunately I bought your book 'Know the future!" By the way, I'm not really negative or upset about conspiracy theories or trying to discourage people from studying them. I did learn some good things from my own study of them years ago, mostly the few that lined up with and thereby illuminated Bible prophecy (e.g., I think the ten rulers of Revelation 17 fit the infamous Illuminati). Others have confirmed that conspiracy theories motivated them to seek answers, as another reader on Facebook said: "For me it was studying 'conspiracy theories' for myself -- Seeing which ones were fact and proven and which ones seemed plausible but not yet proven, and finally also which ones were just incorrect or exaggerated, put out there to confuse, deceive, that first led me to your site Tim McHyde. Much in this world is not as it seems but many people are too lazy or lack critical thinking skills to do any real research, etc and try to comfort themselves by simply labeling others as 'conspiracy theorist'. And many 'fringe' sites, including yours Tim have much worthy information." 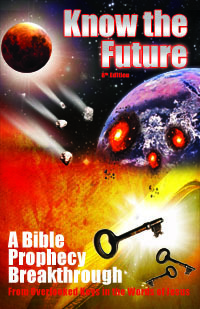 What I go into my book that keeps conspiracy theories at bay is the proof that Bible prophecy is not in process yet. This is a key understanding that anyone can gain and find great peace from. As mentioned above, the reason Bible prophecy fans get so overwhelmed by conspiracy theories is because their interest in prophecy primes them to believe certain ones that much more readily. As they say, a little knowledge is dangerous. In my case, as I have recounted before, my little knowledge of Revelation 18 prophesying the doom of America made the Y2K/Millennial Bug theory about computers crashing on "01/01/00" (January 1st, 2000) that much more plausible. In response, I took the radical step of moving my family out of the USA—just like many people today worried by conspiracy theories consider doing or do. In our case we liked Costa Rica so much we decided to stay all this time. But statistically most people who come here find out it was a big costly mistake and move back within a couple years. They pay a dear price for not seeing through the conspiracy theory. In other words, "we have a more sure word of prophecy" (2Pe 1:19) and we should trust in it. God has revealed his own roadmap in Bible prophecy and that is the one we can count on happening. If men try to accelerate the plan by bringing Armageddon or other events, they will be blocked by God. The New World Order cannot take down America and take over the world until God says so. Therefore, if you already know God's plan, you can safely ignore any and all purported "plans of the enemy" that people try to get you to listen to. God is not saving us or waking us up through disputed conspiracy theories. When he is going to do something he promises to reveal it through his reputable, verifiable, authorized prophets (Amos 3:7). Such prophets are promised for the end times to deliver warning messages to everyone on earth (Mal 4:5=Rev 18:4=Rev 11:3=Rev 14:1,6-9). Why do they fail so badly? Finally it is illogical to run your life based on theories and mere possibilities. It's just not a feasible or effective way to base decisions on. For example, it's possible that you could be struck by lightning even on a sunny day. Do you therefore not ever leave your house for fear of that extreme catastrophic possibility? Of course you do not, unless perhaps you are an agoraphobic who fears leaving home. You instead realize that given the extreme improbability of lightning striking you, reasonable threat assessment dictates that you not give a lot of weight and consideration to that possibility so that you change your life around it. When people worry or change their lives according to conspiracy theories, they are like the agoraphobic worried about merely possible catastrophic outcomes outside their home instead of worrying about the real probable outcomes. It's probable that in a thunderstorm you will get wet, not struck by lightning. Therefore bring an umbrella (and avoid being the tallest thing for miles while you hold it); but don't cease going out completely in thunderstorms based on a slim possibility. Conspiracy theories are a fixture of the Internet and they are not going away. On occasion they are accurate and teach people some helpful things or inspire them to study the Bible. More often than not they terrorize those who do not have the skill or experience needed to debunk them and cause them to make very bad life choices out of fear. They do not grasp the failed track record of predictions and highly improbable nature of conspiracy theories. They also do not realize God already has a plan in the Bible that precludes much of what is theorized to happen using the Bible as proof. Part of that plan is to send an authentic, verifiable representative of his to reveal his plan and give instructions before he does anything, including letting Wormwood (aka "Planet X") devastate the earth. He will not be relying on an army of conspiracy theory believers emailing dubious theories to wake up the world and get people to repent and move to safety.